Discussion in 'The Football Forum' started by gkmacca, Jan 9, 2019. 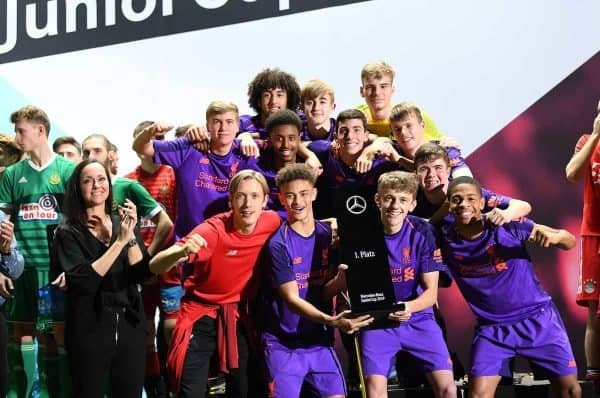 Liverpool U18s won the Mercedes-Benz Junior Cup by coming from behind to beat Rapid Vienna 3-2 in Sunday's final. The young Reds travelled to Stuttgart to take part in the prestigious two-day indoor tournament and qualified for the semi-finals by advancing through the group stage on Saturday. After losing 4-3 at Atalanta United in their opening pool match, Barry Lewtas' side responded strongly to register victories over VfB Stuttgart and FC Schalke 04. Hosts Stuttgart were defeated 1-0 courtesy of Jack Walls' goal, before strikes from Elijah Dixon-Bonner and Fidel O'Rourke saw off Schalke 2-1. 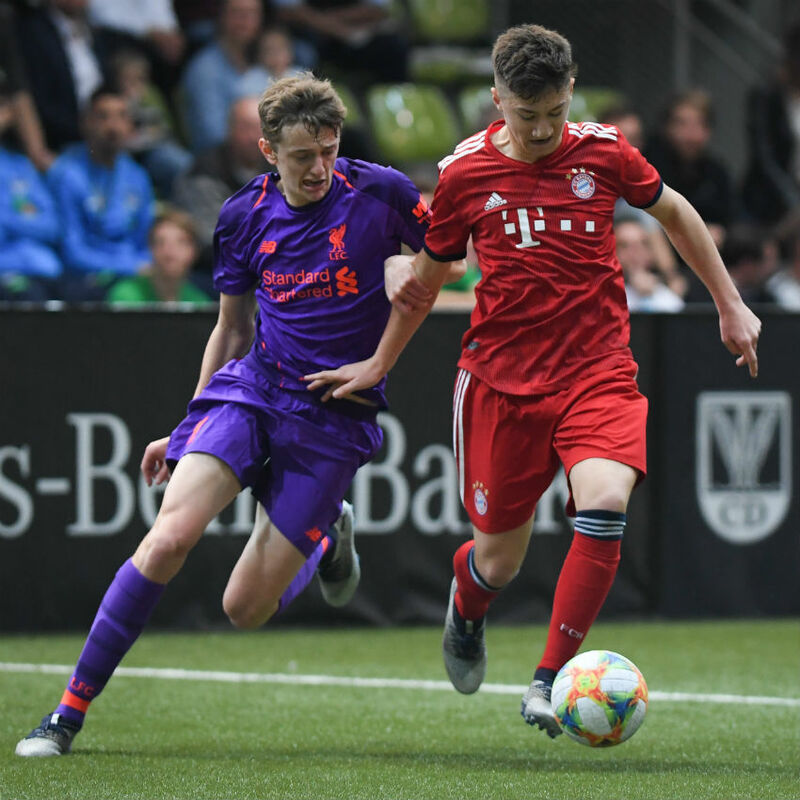 Another German opponent, Bayern Munich, awaited in Sunday's last-four match, and Jack Bearne netted decisively to book Liverpool's spot in the final with a 1-0 win. Vienna opened the scoring in the showpiece game, but Abdi Sharif, O'Rourke and Remi Savage made it 3-1 to the young Reds, who then held on to claim the trophy after the Austrian outfit had pulled one back. Reflecting on the tournament victory, Lewtas told Liverpoolfc.com: "It's fantastic to win it and the boys did the club proud. "We had a young team out but they stuck at it and we showed what we are about. It was a brilliant experience for them and we are delighted with the boys. "Vitezslav Jaros was named goalkeeper of the tournament and that was a nice reward for the progress he is making under Neil Edwards." Oncy, dantes, Frogfish and 3 others like this. I still marvel at that name. He's either going to be a famous superstar through some means, or will spend a miserable life in and out of prison. There is no in-between. dantes, FoxForceFive, Insignificance and 1 other person like this. Destined for big things with a name that good. Yes. His name wouldn't look out of place as the title of a George Gissing novel, or maybe a zany sitcom. He WILL succeed, I have no doubts! Liverpool flop Lazar Markovic remained at the club this transfer window, against the odds after a move to Belgium fell through. The Serbian flopped following a big money move under Brendan Rodgers and has been cast side from Jurgen Klopp's squad to play with the under-23s. Markovic was in the Liverpool under-23 side at the weekend which was knocked out of the Premier League Cup competition by West Bromwich Albion. The big story was the player who replaced him and almost inspired a successful fightback. 16-year-old attacker Fidel O'Rourke nearly made the breakthrough, withLiverpool's official website picking out his 'lively' performance for praise. This was O'Rourke's under-23 debut and despite the defeat it was a good way to start. O'Rourke was born back in 2002 and has been playing for Liverpool's under-18s this season. A strong start has seen him net two goals in three games, enough for him to get the call up to the under-23s. Outperforming Markovic on his bow may say as much about the Serbian's predicament as it does about the teenager's emerging talent, with the two players moving in very different directions. refugee, SummerOnions, Judge Jules and 6 others like this. Clearly going to be a big name bad guy on the PS4/XBox. Probably a mercenary in Mexico or South America. So you're clearly not a gamer then. Haha - I'd LOVE to but unfortunately I'm in China and playing online here (Shanghai) is next to impossible with the speed of our internet and banned sites. A major PITA. Strangely (or maybe not so strangely considering the 25 million that live in Shanghai) I had waaaay faster internet in a deserted fishing village on an island off the coast. The internet in Shanghai stinks. VPNs being attacked by the Govt. these past two weeks make access even worse (both Astrill and Vyper, the ones I've paid for, down). Bradley and Insignificance like this. Ha he's a nice kid. Very quiet. Hopefully it will be the former. Highly doubt it will be the latter. mark1975, doctor_mac and gkmacca like this. How is it possible we have a thread on a kid with a superb name and nobody has commentes on his team mate Elijah Dixon-Bonner? Because he sounds like he enjoys fox hunting. darkstarexodus, mark1975, Insignificance and 1 other person like this.